Lutens's newest, about to hit Barneys anytime now. "Le 5 O'clock" is of course the phrase in French for afternoon tea, and I approached the scent keeping this angle in mind. Notes of ginger, honey, pepper and cocoa has me thinking that perhaps this would be a much stronger concoction than it turned out to be. It is all about tea, but not in the smoky, almost savage way that say, Dzing! or Chergui are; those are being served milky tea in a circus tent and being served smoky Souchong by a hot Sheik respectively. Gigembre is tea served in a fine hotel: Earl Grey and shortbread cookies with crystallised ginger, with a base of cacao and patchouli as if the finely dressed matron at the next table had ordered some hot Valrhona. It's also perhaps one of the most accessible Lutens fragrances in a long while. It does none of the antics of some of his other scents (which I love, mind you), there's no contrapuntal blast of gasoline or menthol or whatever, it's just reassuringly plush without being twee or pretentious. It smells like what I imaging tea at the Crillon must be like: luxurious in that French way of giving you just enough of something really perfect to sate. I actually surprised myself by liking it more and more with each wearing; this quickly went from "meh" to "gimme". I assume that it will be $120 when it hits Barneys, Aedes and ScentBar (the latter by phone only). 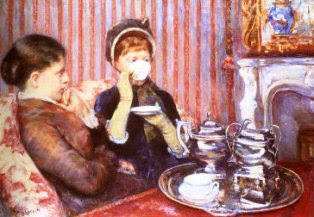 Five O'Clock Tea by Mary Cassatt is from allposters.com. Can you email me, by the way, at erintigchelaar at yahoo.ca? Having ready one happy review after another I was all kinds of excited about this. I imagined it would make me salivate when I smelled it on me, an unfair expectation. Really, only 2 or 3 'fumes do that for me consistently. So, I was disappointed. Loved the initial ginger top, more crystallized than dried gingerbready, as you say. But then, I don't know, it faded into something unremarkable & vaguely warm. Meh, exactly. I'll retry; perhaps I'll transition as you have to Gimme. I did like it. I was rather surprised I did, actually. I think I need a bottle of this. I sprayed some on at Barney's in NYC, didn't think much of it at first sniff, and then forgot about it. Later, I noticed something wonderful-smelling on my hand. It was the 5 O'Clock! No, it's not wildly original and daring, but it does smell really good, and that's enough for me. It *does* smell good. Understated, elegant but, my oh my, delicioso, mi amor! I'm trying again now. This time I got more tea, less ginger in the top. Orange spice tea, actually. Half hour later now it's pleasant & hate to say it, nondescript. I guess a soft honeyed, gently spiced somethingsomething. I'll put more on before I go out, see how it wears through the day. I swear, when I heard about the fragrance, I thought of this picture! Cassatt--not my favorite impressionist, but an interesting character nonetheless. I'm excited to try this, you make it sound truly lovely. While I'm a fan of the olfactory acrobatics that he can achieve, I find I'm on the hunt for something "easy" right now. Anything easy, please! T, I'm curious -- I've found almost everything by Lutens accessible lately -- did you find Louve & Sarrasins esoteric? Or Rousse? That's it exactly. It snuck right up on me as well. Mmmmm...Patty mentioned Tea for Two (plus! plus!) and you make it sound like that, too. Hope they have it in Aedes by mid April. It is pretty delicioso, ain't it? this then might be right up your (easy) alley- I was surprised it was right up mine..
Louve I found comforting. Sarriasins I adored because of the opening but I wanted it to go about 180 degres away from where it went. Rousse I think is the closest to this, with ginger instead of cinnamon. I guess Lutens is in his "nummy" phase right now (not that I would second-guess) which is fine with me. I think Aedes should get it very soon, yes? No, if this were l'Artisan it would be wearing a lampshade for a hat and singing. Well, maybe not that far. Or maybe a really nice lampshade? Then again, l'Artisan did do Dzing!, yes? i can't wait to smell this.lovely review! Great, appetizing review, Tom! Can't wait to try this, sounds like a true comfie scent. I just got my sample and so far I've just sniffed a drop on my hand- mm, ginger, honey, something..citrusy? Nice to hear from you! I think it took me about ten minutes too! comfy is a word for it. elegant is another- it's like a beautiful cashmere coat that looks so good on you you wouldn't want to take it off even if it wasn't the snuggiest thing you've ever had on..
denise- yes, I believe there is a twist of citrus in there.. let's hear how you found it in depth! Cannot. Wait. To. Try. This. Sounds like I'll like it - I lovedlovedloved Rousse and I love ginger. Five O'Clock is already out here in Italy. I've sampled it three times but I'm still not sure about what I feel. On me it smells a lot of orange tea, with the ginger always present, and it dries down to something completely anonymous. I don't hate it, as is the case with other SL, but I don't want to wear it either. Love this scent! Am not wild about the opening, but after a half hour or so I'm in heaven. On me it's very much like Rousse. You're right about it being very accessible. I think this is going to be a best seller in the line. Barneys fors have 2 hours free parking. Just sayin.. I agree, I think this one is going to be a hit for them.